Classroom Clickers - Know what your students know...instantly. Know what your students know instantly. Classroom clickers or student response systems have become high-demand classroom tools in schools, universities, and training programs across the country. While the way in which "clickers" are incorporated may look different - involving mobile technologies such as smartphones, iPads, Android tablets, or Chromebooks - the premise is the same as it was 10 years ago. Know what your students know...instantly. Research on clicker technology has proven that student response systems, in whatever form they may take, are not a trend or a fad. Instead, they are a true instructional technology that can change instruction and impact student learning. How Do Classroom Clickers Work? 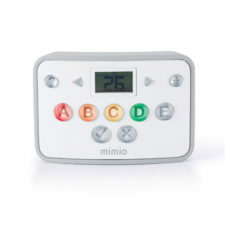 Each student has a wireless handheld response pad, or clicker, with which they are able to answer questions posed by the teacher. This "clicker" may even be built into apps like MimioMobile and contained in a device like a smartphone, iPad or Android tablet, Chromebook or laptop. The teacher poses a question verbally, with a written assessment, or through the computer onto a projector or television screen, and the students respond with their classroom clicker. The adjacent video shows MimioVote, a hardware clicker, in action. Clickers provide true data-driven instruction. After students respond to a question using their tablets or response pads, the teacher is able to see immediately how students answer and if they understand the material being taught. This provides data to decide if remediation is needed or if the teacher can forge ahead with new material, based on student results and/or obvious misconceptions. Clickers involve everyone and embarrass no one. Clicker technology allows every student to answer without the fear of humiliation or negative attention. When using student response systems, every student can share their input without embarrassment rather than allowing one or two eager students to dominate discussions. Clickers engage and motivate students, making learning fun. Clicker technology, very similar to the familiar feel of a remote control, is comfortable and fun for students of all ages. The younger generation instinctively knows how this "gadget" works, and the immediate feedback it provides makes learning fun and effective for both young and old. Incorporating clicker technology into a BYOD environment with software such as MimioMobile makes participation for students even more motivating. Clickers are effective in both formative and summative assessment. Student response systems offer a wide variety of formative and summative assessment options, including teacher-driven or student-driven. Questions can be posed entirely through the computer for a daily pop quiz, reviews, surveys, or verbal questioning during lectures. With the self-paced testing mode available in some clickers, students can also progress through assessments at their own speed. Students can even take paper tests through the remotes, which saves the instructor prep time and still allows the software to do the grunt work of grading. Although we highly encourage the use of clickers as formative assessment tools, we can’t turn our backs on the benefits provided to teachers bogged down in papers and tests to grade. When clickers are used to grade assessments, teachers have the ability to deliver information to students, parents, principals, other teachers, and district administrators immediately. Classroom clickers make grading of both formative and summative assessments a snap, and the ability to pose verbal questions and receive immediate feedback from students allows the instructor to change the dynamics of what might be an otherwise tiresome lecture period. There are so many creative ideas that you can implement with clickers that will engage and motivate your students! Liven up lectures, uncover misconceptions, create competitive games...the list goes on and on. I am not overstating anything when I say these are the most powerful pedagogical tool I have seen in 40 years of teaching. NO kid can remain passive. They must participate (anonymously to their peers but not to me) and I should take a picture of the kids' faces when we are going over the questions and they are participating and competing!